I used to be volunteer extraordinaire, being a part of every organization that my kids were involved with, as well as things for the school and for church. I no longer run the Kingston Strings Program, or am a brownie leader. But the one thing I still do every Sunday is co-teach for our Church's Children's Liturgy program. I am not sure, but I think Kay and I have been involved in this program for about 17 years. Children's Liturgy in our church, happens in the annex, and our priest calls the kids to the front right after his opening prayer. He chats for a sec with them about the day or about the season and sends us off to the annex for the next 30 minutes. Once in there, we all get in a circle, and its my job to light the candle. Kay always says to the kids "When we light the candle, what does that mean?" One or two always says "we have to be quiet while we listen to God's word". Its actually pretty cute, and we get several versions of that same statement.. depending on who happens to be there that week. Kay reads the readings and the gospel (kid versions) and the children are very good to listen. Of course, they have me wandering behind them, ready to put a reassuring hand on their shoulder if they are fooling around or something. I am so proud of our kids because they truly do stand and listen. Of course, this has evolved over the years. From year to year we get the same students, but eventually they grow too old for the program and new ones are added in each year. As the older ones mature (to the ripe age of 8) they have been involved for 4 to 5 years at this point and understand that they have to listen quietly. They become role models for our brand new 3 to 4 year olds and they learn very quickly that this is what is expected. Once Kay has finished the readings, she blows out the candle, so they don't have to be quiet anymore, and she asks them who we should pray for. Hands dart up and we get lots of suggestions... from Grandparents who are sick, or have died; dogs who are sick; parents who are away (we have mostly military children). We have even prayed for a little baby girl from China who was going to be adopted into a family, and it was nice to mention her every week for almost 6 months. When she finally arrived, a lot of the kids already knew who she was and her name. Her brother and sister mentioned her every week... so we were all anxiously awaiting her arrival as well! Today we even prayed for a fish. Everyone sits down on the floor and Kay does an amazing job talking to the children about the readings of that week. We have an average of 35 kids between the ages of 3 and 8, and she is able to incorporate a lesson about the reading to each of them. Its amazing to see the hands raise when she asks... who was walking down the road... or... what did Jesus say to them... or why did God tell so and so to do that.. Even the three year olds have something to say about what they heard. It makes me smile each week, knowing that we are helping these little ones enjoy and learn about God and Jesus. After Kay finishes... the real work/fun begins... we make a craft. That is usually my job. Kay and I invent a new craft each week, or we recycle some craft from 3 to 4 years ago. 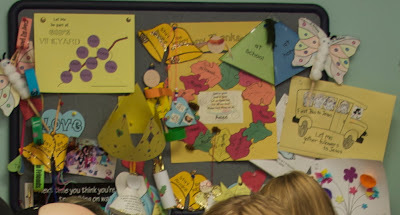 This is the bulletin board full of last years' crafts that I cut out of one of Michelle's wedding pictures. It was hanging in the annex when we were getting all the little children ready for the wedding. The bulletin board looks very different now, with just a few crafts on it, since we have only being into this year of Liturgy for about 6 weeks. The books at church recycle ever 3 years, so we don't have the same readings each year. I usually am the one to design, print and cutout the craft each week and bring the supplies. Then when we get down to crafting. We rely on our helpers to each sit with a circle of kids and help them to create using glue, glitter, crayons.. or what ever is usable. We have 4 big girls (age 13-14) who come out with us each week. We didn't have them last week (prolly cause of Halloween) and we really felt they're absence. It was nice to have them back this week. Our craft for this week involved cutting out 160 hearts (Thanks Kay), 40 big circles and 40 little circles. The kids glued the hearts onto the big circle and then put the little circle on top of all the points to hid them. We ended up with a big poppy, which ties in really well with Remembrance Day this week on Wednesday. We even made a couple of extras for the two priests and our organist. It was a really fun craft and a great day.